I… I think we can finally call spring being here? 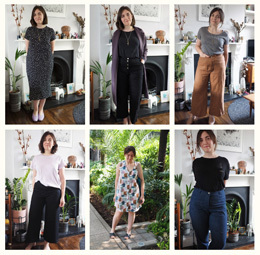 I’ve packed away my coat and jumpers at least, and I’ve made a spring-y version of my favourite trousers. 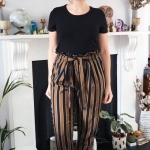 Making a second pair of True Bias Lander pants has been on my to-do list for ages. I wear my first pair all the time, but they’re made of quite a thick denim and it’s getting a little too warm for them (hurrah!). My heart got set on an ivory/cream pair, and to that end first off I bought some needlecord which unfortunately proved too this and rather see through. I tried dyeing them but they just turned out patchy and weird. Into the scraps bin they went. 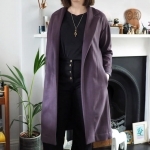 After sulking a bit I ordered some Robert Kaufman Ventana twill from fabric.com, since it’s the fabric Kelli used in all the pattern samples. Ordering from this US-based site from the UK is easy enough by the way and shipping isn’t too costly. I did have to pay £10 in customs and deal with the ungodly nightmare that is UPS delivery; it’s really cheap and has a great range though, so it kinda evens out! 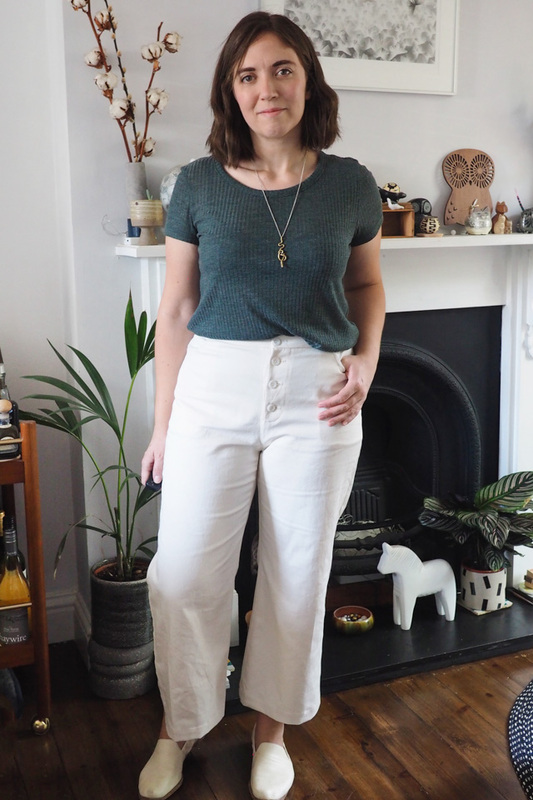 The cotton Ventana twill is indeed a good match for the pattern; I would actually call it light-medium weight rather than fabric.com’s medium/heavy description, which I think is why it creases a bit readily. There is still a bit of pocket and seam-allowance show through but not enough to bother me this time. I decided to convert the patch pockets to inside pockets, which Kelli has a tutorial for, though now I’ve seen them I think I prefer the original pockets to break up my expense of hip, hah. 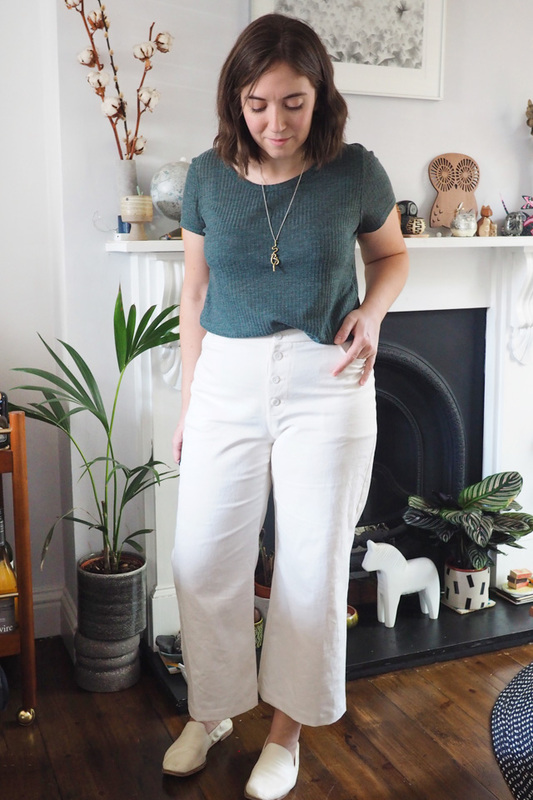 I’m hoping these will be just as wearable as my denim ones for spring and summer, though being of the clumsy/messy variety we’ll see how long they stay white! 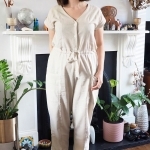 I have lots of other sewing plans for the warmer months – most definitely including Kelli’s newest pattern, the Yari jumpsuit. They look great, I am think of ordering some of that fabric from the US too, I have looked for it in the UK with no luck. Does the fabric stretch after wearing them? It’s a non stretch fabric, I noticed it ‘relaxed’ a little bit after wearing but didn’t stretch exactly. The benefit of white, I guess, is that you can wash it much more intensely without worrying about fading. Is Barkeep’s Friend sold in the UK? I dilute it and use it on stains that OxiClean oxidizes instead of removing (i.e., deodorant stains – probably less relevant on trousers). Anyway, these look sharp and springy! Nice fit too! After reading your review of your first Landers, I decided to give the pattern ago. It waz first time uding an indie oattern and a PDF. 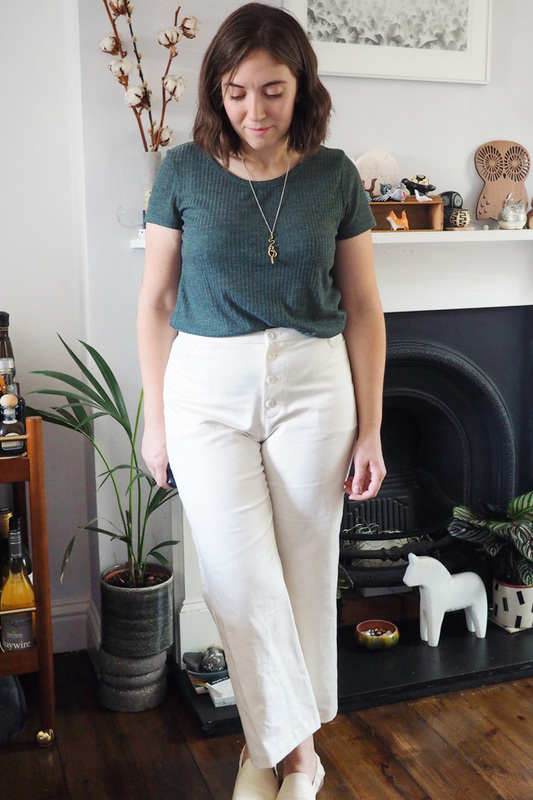 It is now my favourite trouser pattern – very flattering and easy to adjust the fitting. Thank you! Glad to hear you had success with it too! Goodness – my apologies for the horrendous typos; it looks as if I dictated my message to the dog. Thanks for being polite enough to reply!